Home » Grow Information » What Is Hydroponics? in Hydroponics, The Basics of Hydroponics . What exactly is hydroponics and how does it work? Hydroponics is the intentional act of growing plants without soil. Nutrients, instead of being soaked up from soil, are administered through a nutrient-rich solution that provides the exact minerals the plants require. This allows the plant to grow at a time where plants in soil would be searching for nutrients. The plants, however, still need a medium to grow from that will support the roots. There are a number of growing media (peat, coco coir, rockwool, vermiculite, expanded clay pebbles or hydroton, and perlite) that support the structure of the plant while providing a favorable moisture ratio for the plants. This makes for a potent combination that allows for plants to not only survive, but thrive. Gardening indoors all year round is a couple of grow lights away. Little to no need for pesticides because of sanitary medium. Plants do not need to compete for nutrients, thus allowing more to be grown in a given area. What are the advantages of hydroponics compared to soil? Hydroponically grown plants grow faster and healthier because they consistently maintain optimal nutrient and moisture levels. The plant is able to focus most of its energy on growing the plant instead of the roots because it doesn’t have to search for nutrients. This ultimately means room for more plants because the root systems don’t have to compete for the readily available nutrients. These plants never become root bound and don’t have to be repotted. This adds to the less amount of work that has to be done compared to the weeding and digging associated with soil. Soil also carries pests and diseases which are potentially bad for the plant. Hydroponically grown produce also lasts longer than soil grown. What types of plants will I be able to grow? Typically you would want something that could be fit into tight spaces to optimize the amount of plants you could fit, but just about any plant could be used. Good, generic vegetable plants to grow are tomatoes, cucumbers, beans, spinach, lettuce, hot chilies, broccoli, chard, snow peas, squash, and sweet peppers. Herbs, flowers, and house plants will also grow well in a hydroponic system. These types of plants fit well together and don’t take up too much space like a watermelon would. A watermelon could definitely be grown, but because of the plants massive size, you wouldn’t be able to fit many in, regardless of the roots. Can hydroponically-grown plants be organic? Yes, although they were once thought to be incompatible. Hydroponic growing is founded on consistent nutrient availability, whereas, organic fertilizers work by breaking down after a period of time from bacterial action in the soil. There are multiple hydroponic nutrients that are made from organic ingredients and more are being created every day. How will the flavor of hydroponic produce compare to produce from an outdoor, organic garden? Typically, the hydroponically grown produce will taste better than vegetables from an organic garden. This occurs because the plants do not need to focus on finding nutrients because they are fed the nutrients. They will therefore grow much healthier, and tastier, than their organic counterparts. In soil, the nutrients are often bound up and hard to be taken advantage of by the plants. 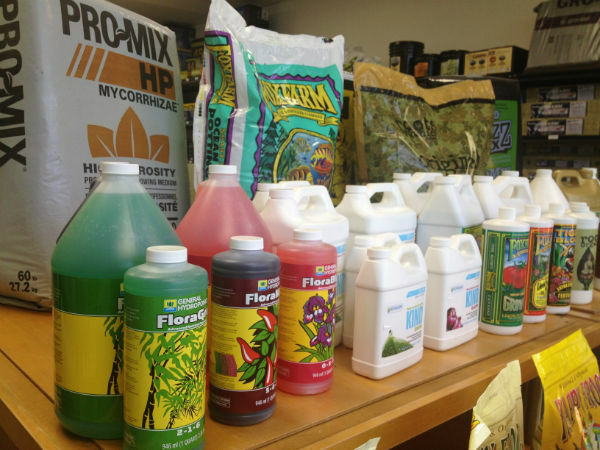 In hydroponics, you can control exactly the type and quantity of minerals needed for your plant’s success. This creates the opportunity for your fruits and vegetables to be larger, tastier, and even have better nutritional value. Hydroponics is the growing of plants, without the use of soil, in an inert medium. These plants are fed a scientifically perfected mix of macro and micronutrients. For this reason, just about every type of plant can be grown this way, and the plants that are grown this way thrive. The plants respond more rapidly to the direct source of nutrients and don’t have to waste their time and energy trying to find the nutrients. This means a greater yield in a shorter period of time. Tests have also shown that produce grown hydroponically contain more vitamins and minerals than soil-grown. This includes even the highly praised organic vegetables. The flavors are outstanding and untainted because little to no pesticides are needed. Without the need for soil, these plants can be grown nearly anywhere, even indoors. Of course, growing indoors would require a grow light that produces the quality of light the sun does. When we think of hydroponics, we think of something that has just been conceived, given all the necessary chemistry and technology. However, the definition simply means to grow plants in water, which has been done for many hundred years by many cultures. The floating gardens of the Aztecs of Mexico, the hanging gardens of Babylon, and the gardens of the Chinese are literal examples of Hydroponic culture. Even Egyptian hieroglyphs depict the act of growing plants in water. Now, over the last hundred years, horticulturists and scientists have experimented with hydroponics, trying to capitalize on its pest free growing. Hydroponics is now integrated into the space program, and was even used to feed troops during World War II. It has since become utilized by farmers and gardeners who see the vast array of benefits associated with hydroponic growing. The main things needed to start a hydroponic system are pots and growing trays for your plants to be held in, a reservoir to hold your nutrients, and a pump to circulate those nutrients. This is an automatic system that does not require hand watering making it very efficient and the water equally dispersed. You can choose to either build your own system or purchase a prebuilt system. Building your own would require you to purchase various kinds of equipment at your local hydroponic shop and hardware store. If you choose to buy the system prebuilt, you will have multiple different options, ranging in sophistication and price, from under $100 to several thousand dollars. This size you should get depends on the scale and the environment at which you plan to grow your plants. If you’re only looking to grow a couple plants, then various systems such as the SoloGro, the WaterFarm, or the Baby Bloomer will hold from around two to six plants. If you are looking to make your garden a little bit bigger, the MicroGardens will support around six to eight plants. Now, if you are looking to upgrade even further, the WaterFarm Kit will support eight big plants and has a main nutrient control system. A different type of system is the American Hydroponics 3x3 ebb and flow system. This allows you to fit many smaller plants in the 3x3 trays, or you could go for ten larger plants. A cheap route that avoids the systems is to hand water your plants in a mixture of vermiculite and perlite. This is still a better option than soil plants as it is still a hydroponic method. It will therefore still give a better yield and grow faster, with a similar amount of effort. In order to grow hydroponically, you’re going to need an inert growing medium that supports the plants and protects the roots from sunlight. A few common mediums have been introduced because of the way they hold oxygen and water. These media are good at draining well and also provide moisture around the root zone, allowing the nutrients to be absorbed. The media that are currently used the most are things like expanded clay (Hydroton) and Rockwool, but sand, gravel, perlite and vermiculite can also be used. The choice of the medium will likely not have the most substantial effect on the success of the plant because, unlike soil, they do not provide the actual nutrients. Their main purpose is to set up an environment where the nutrients can reach the roots. If your plants are outdoors they should have no problem getting the appropriate amount of light. If, however, your plants are indoors then you need to have an artificial light that maintains the correct spectrum and intensity. High Intensity Discharge (HID) Lights are the answer and there are two types of these lights: Metal Halides (MH) and High Pressure Sodium (HPS). MH lights are on the blue end of the light spectrum and are used for young plants and are also used for leafy green vegetables. HPS lights are used for the type of plants that produce plants or flowers. For more information about which lights would be best for your needs, click here. An essential part of hydroponics, nutrients are like food for a human. All of the food the plant needs is in a nutrient solution that is administered to the plant through the system. This solution also helps stabilize the pH level, something very important in the growing of plants. The pH selects what nutrients will be absorbed by the plant’s root system and should be customized to each type of plant being grown. For more information regarding nutrients and pH click here. The air that surrounds the plants you grow is just as important as the light, water, and nutrients. Having proper ventilation around your plants removes the humid air and excess heat, while providing the necessary CO2 that plants need. CO2 supplementation can be used to increase a plant’s health and potency. To learn more about the important aspects of ventilation and CO2, click here. Just like a person, a plant is heat and cold sensitive. So in order for a plant to be healthy, keeping the temperature optimal is important. Indoor grow rooms usually get enough heat from the lamps. On the other hand, greenhouses usually need a source of heat in the winter. Most temperatures can be kept stable through proper venting, however, if the room is running 3,000 watts of light or more then air conditioning might be necessary. This also may hold true if you are enriching the area with CO2. For more information about temperature, click here.